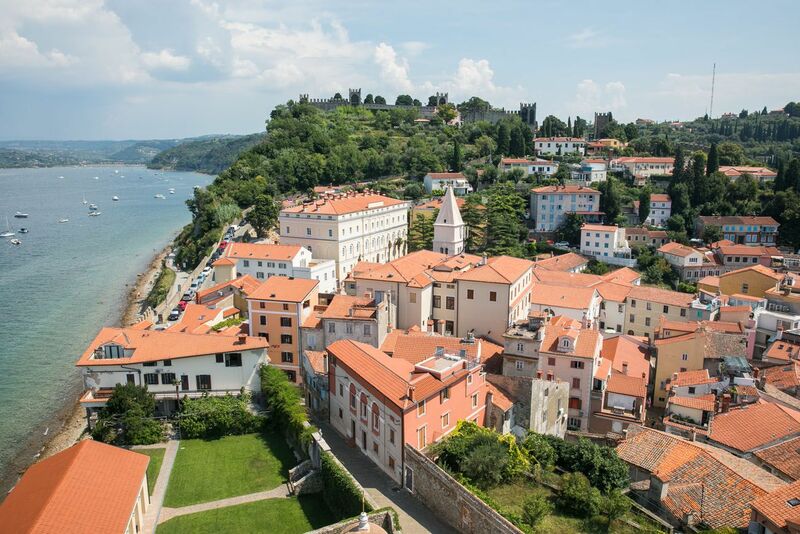 Piran and Koper are two beautiful coastal towns located in Slovenia. Piran is well known for its colorful main square, medieval walls, Venetian-style bell tower, and access to beaches. 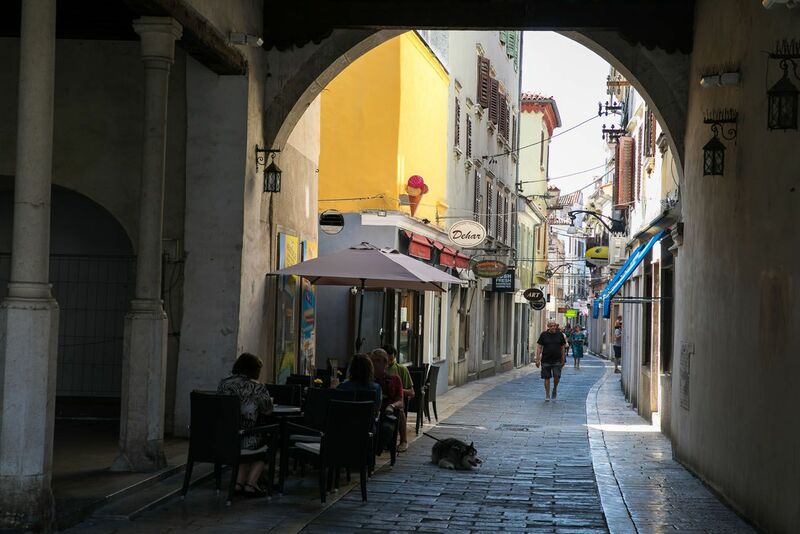 Koper is smaller, but with its narrow, boutique-lined streets and historical sites, it is worth a quick visit. 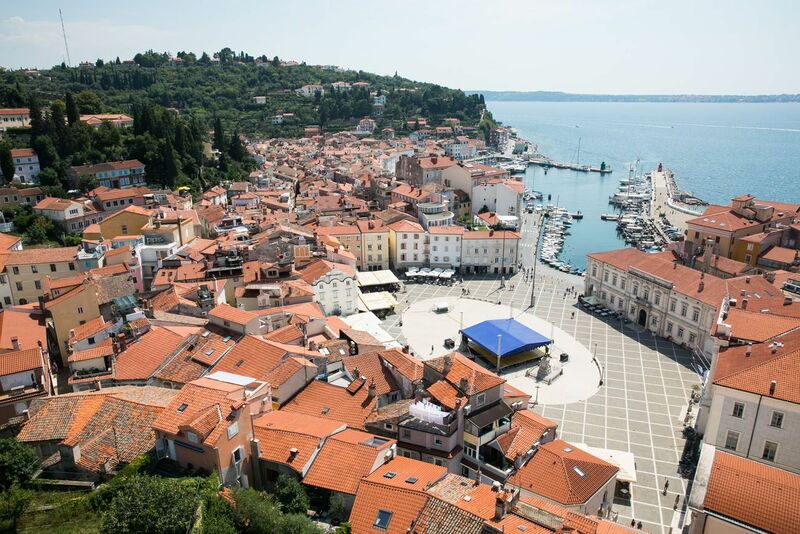 In this article, learn how to spend one day in Piran and Koper. Both Piran and Koper sit side by side on the Adriatic Sea. Located just 18 km apart, traveling between the two towns is quick and easy. 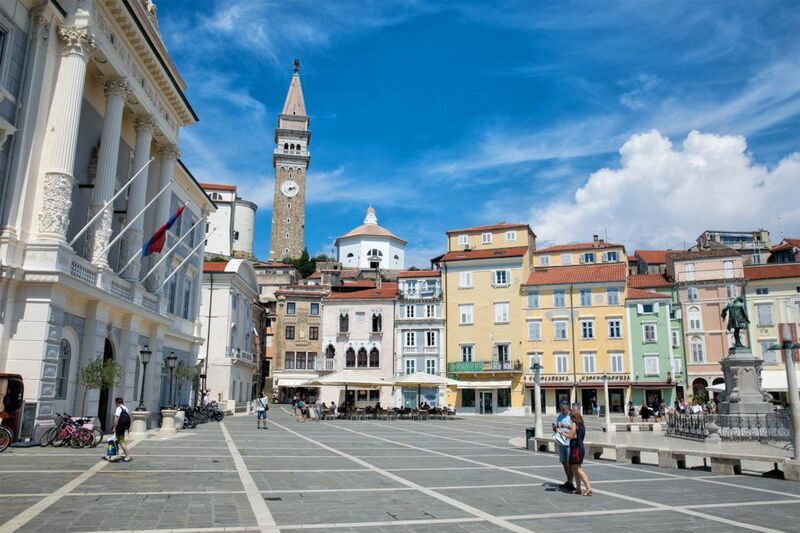 Many people visit Piran on a day trip from Ljubljana. 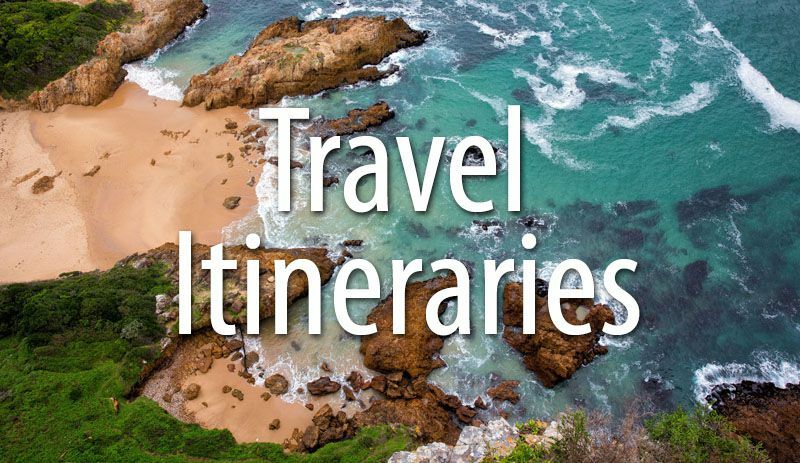 However, you can also day trip to Piran and Koper from Croatian Istria or Trieste, Italy. The easiest way to get around Slovenia and the Istrian Peninsula is by car. 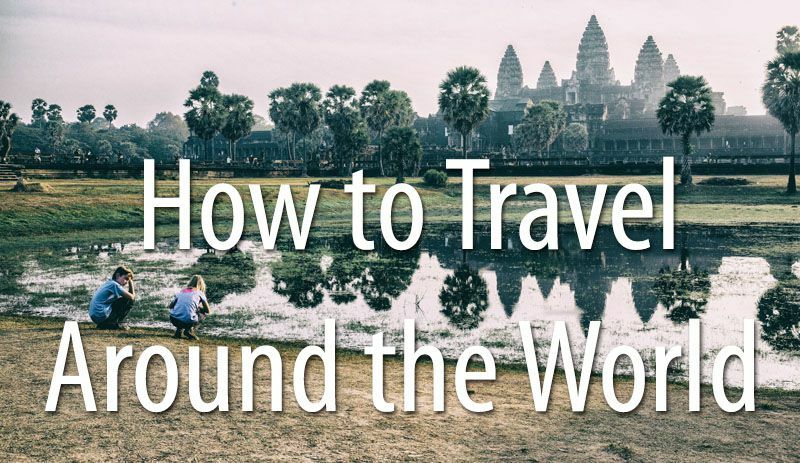 There is a public transportation network of buses but having your own car gives you a lot of freedom and it makes getting around very convenient. From Ljubljana. From Ljubljana, you can get to Piran by public bus or car. Public buses leave hourly and take 2.5 hours to travel between Ljubljana and Piran. By car, it is a one and a half hour drive. 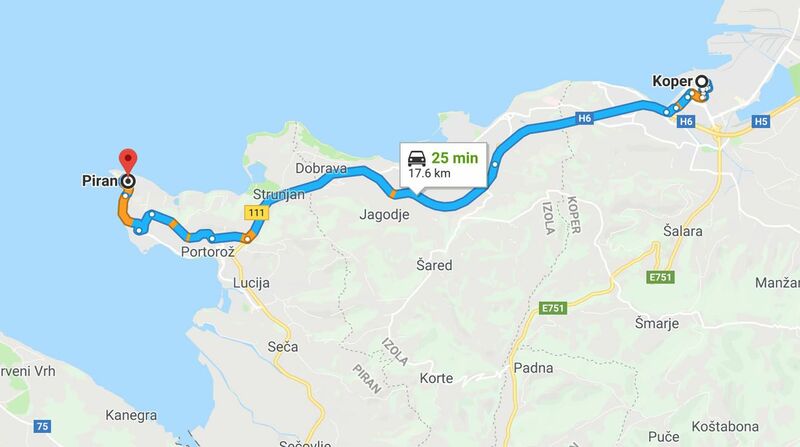 If you plan on using the public buses, there is a bus that connects Piran and Koper. 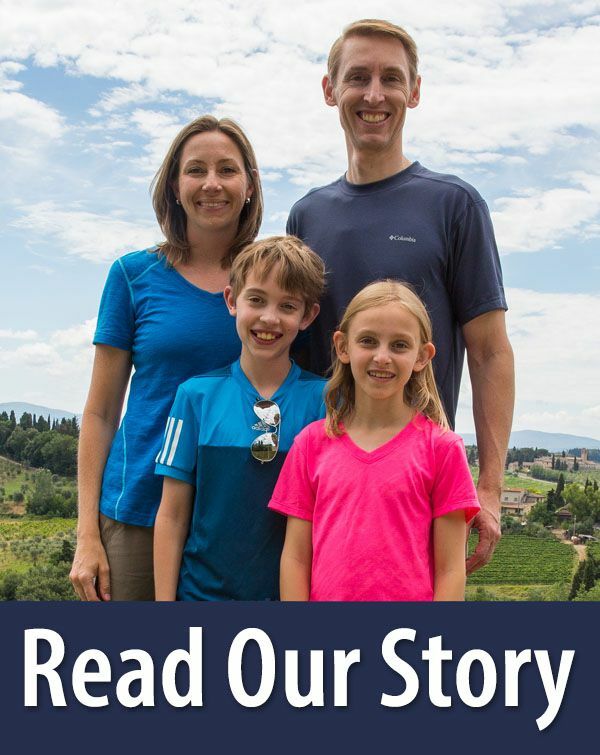 Learn more on the Rome2Rio website. From Croatia. 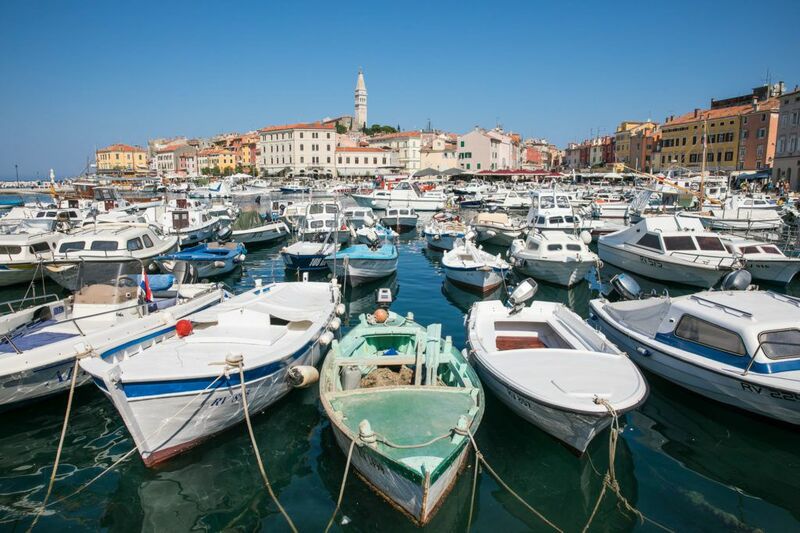 If you are staying on the Istrian Peninsula, the best way to get to Piran is by car. 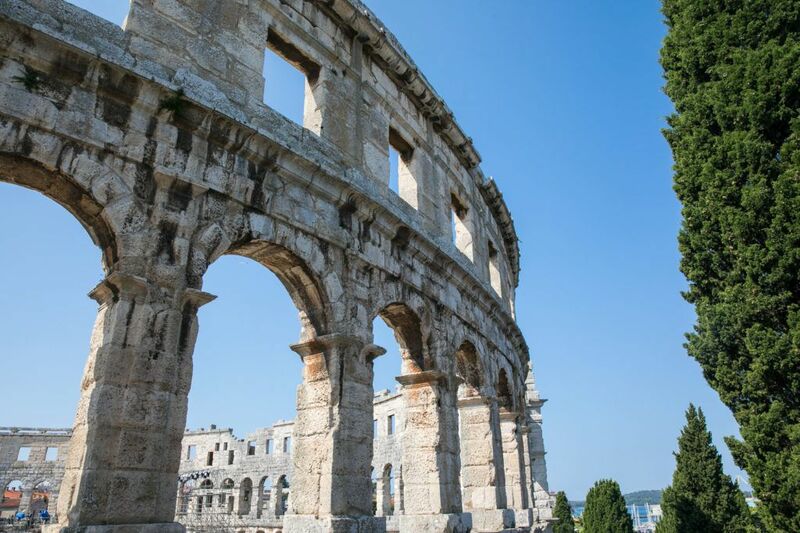 From Rovinj, which is centrally located along the coast on the Istrian Peninsula, it takes an hour and fifteen minutes to drive to Koper or Piran. You will have to cross the border and this can add extra travel time. In the summer, lines can be very long to cross the border. We visited Piran and Koper on a day trip from Porec, a small town on the Istrian Peninsula in Croatia. In order to avoid long lines and delays at the border, we left our hotel by 8 am. Even then, we had to sit through a short line, which added about 15 minutes to our drive time. Later in the morning, wait times were approaching an hour for both directions at the border. It was early August during our visit. 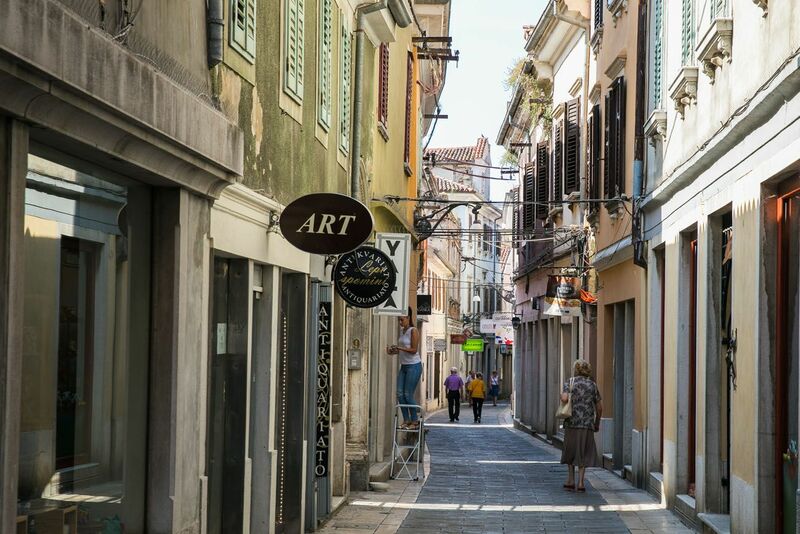 You can visit the towns in either order, but we recommend starting in Koper. Koper is the smaller of the two towns. There is less to do here so your visit will be quick. Also, Piran is more fun to explore, so I recommend saving the best for last. Koper has a compact old town and a port to visit. We parked in a large parking lot just outside of the old town (it is labeled as Parkirišče za tržnico on Google Maps). Tito Square (Titov trg). 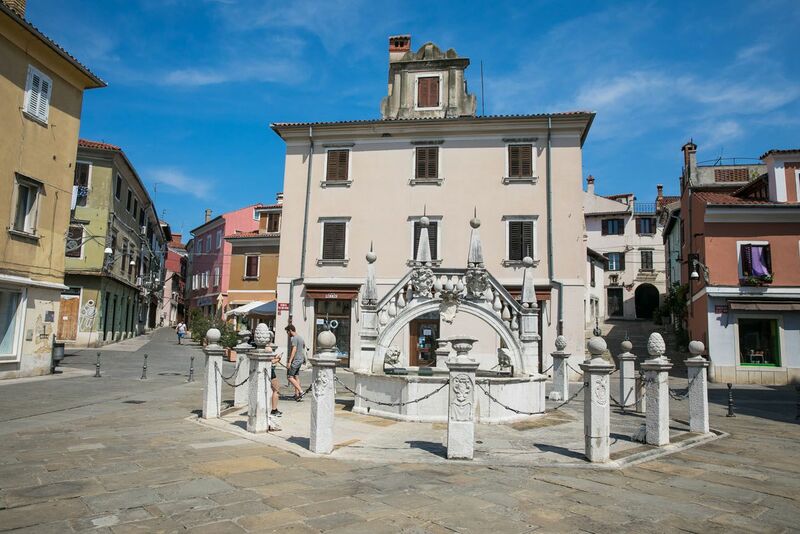 This is the main square in Koper. Located on the square are the Praetorian Palace and the Koper Cathedral. Praetorian Palace. The Praetorian Palace is a 15th century Venetian Palace. It is one of Koper’s landmarks and the seat of government in Koper. 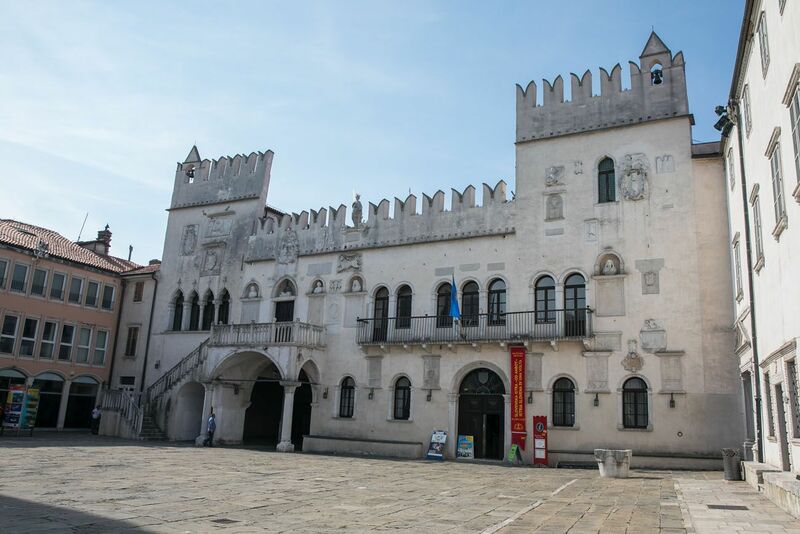 You can take a tour of the palace if you want to learn more about the history of Koper. 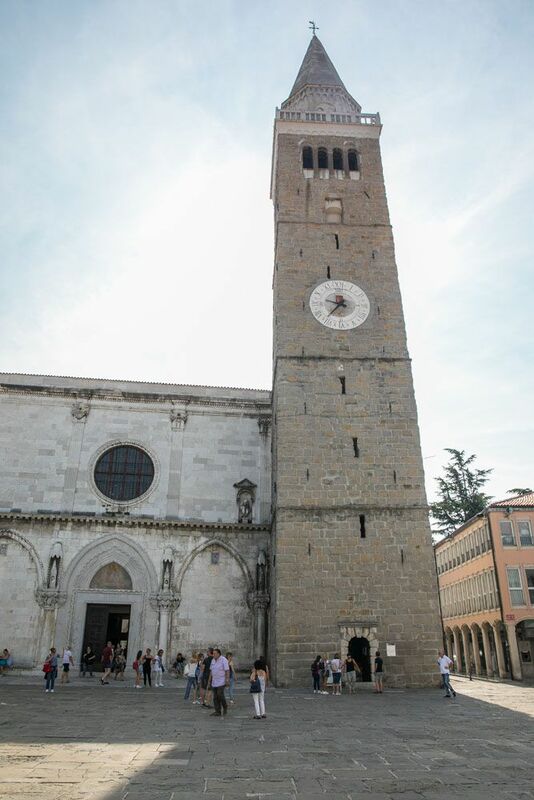 Climb the Bell Tower of the Koper Cathedral. 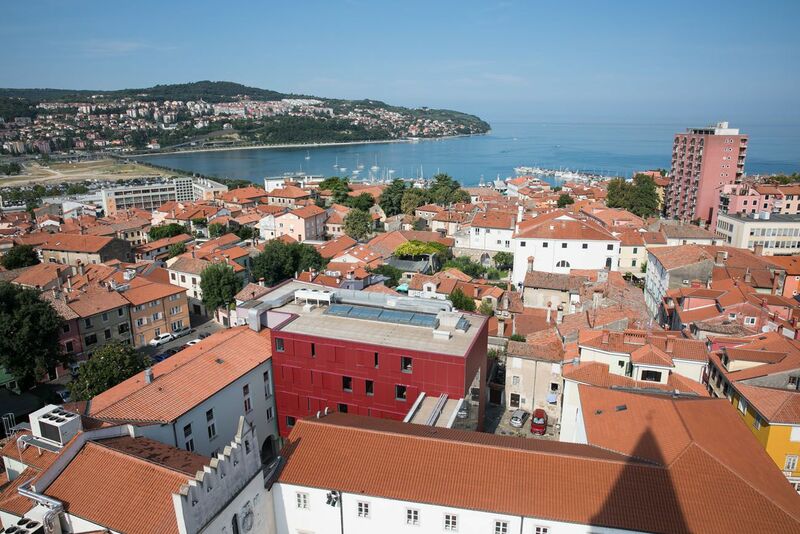 For the best view of Koper, climb 204 steps to the top of the bell tower. From here you will have 360° views over Koper and the coastline. 3€ per person. Stroll the city streets. The streets of the old town are narrow and filled with small cafes and shops. Our favorite street was Cevljarska ulica, which heads south from Tito Square. Da Ponte Fountain. This current fountain dates from 1666 and until 1898 it served as a potable water source for the city. Vinakoper. Located outside of the old town, Vinakoper is a great place to go if you want to try some Slovenian wines. They open at 8:30 am…is that too early to go wine tasting? Unfortunately for us, we visited Koper on a Sunday, the one day of the week that Vinakoper is closed. How much time do you need in Koper? 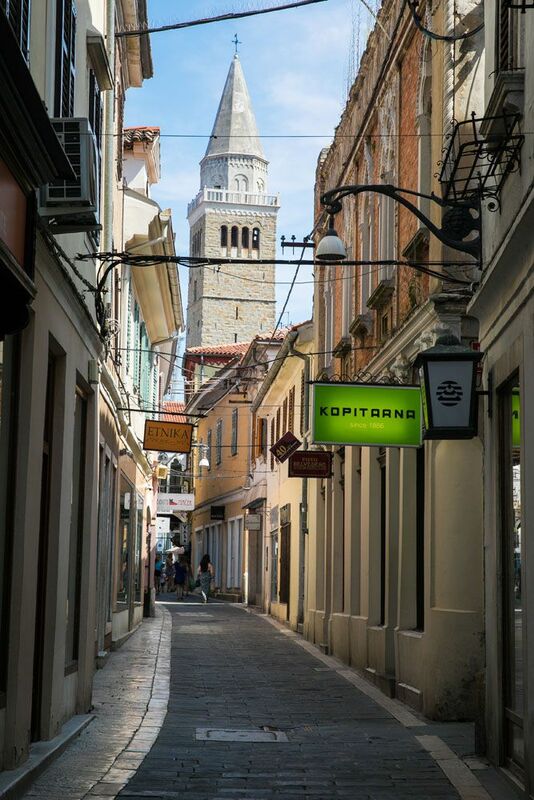 If you stroll the city streets, climb the bell tower, go shopping, and stop into a café for a snack or a cup of coffee, your visit to Koper will last about 2 hours. A tour of the Praetorian Palace or a visit to Vinakoper will add more time. If you have a car, it is a short but beautiful drive from Koper to Piran. It takes a half an hour to drive between the two towns. 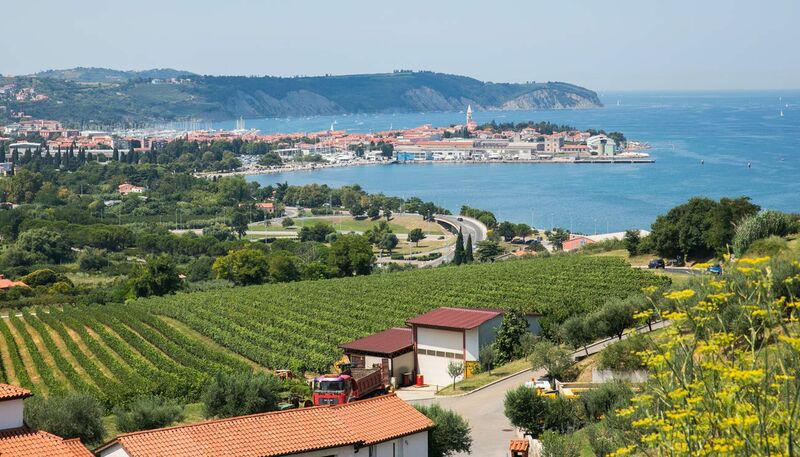 The entire drive is along the coast and on the way you pass by the third town of Slovenian Istria, Izola. A view of Koper as we drove to Piran. Looking west along the coast. 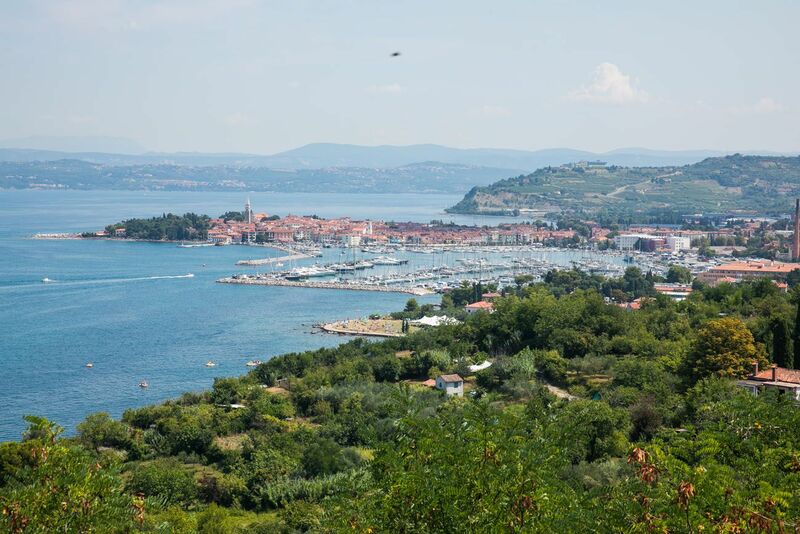 The small town on the peninsula is Izola. About Parking. Unless you are staying at a hotel that offers parking, you will not be able to park your rental car in town. There are two parking garages for visitors located outside of the old town. We parked at Garage Fornace and from here it was a 10 – 15 minute walk downhill into town (it will be an uphill walk on the way back to your car). Garage Arze is another option. If you are using public transportation, there is a public bus that runs between Koper and Piran. 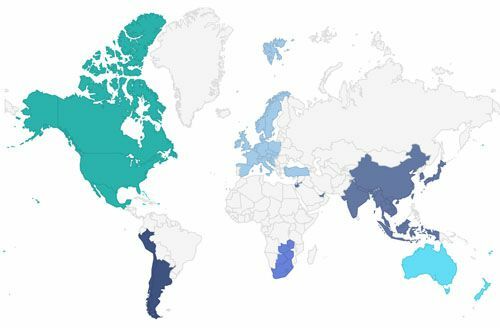 Learn more on the Rome2Rio website. By the time you arrive in Piran, most likely it will be lunchtime. 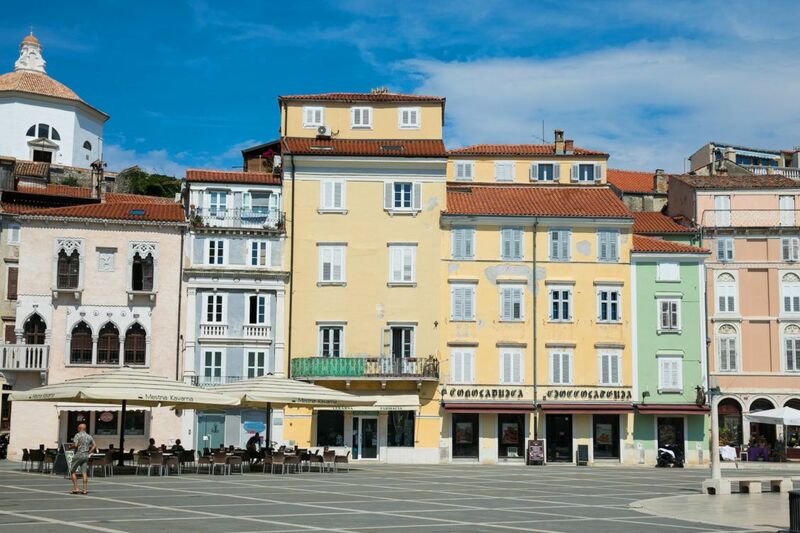 Piran is filled with an abundance of seafood restaurants. We ate lunch at Pirat, located right on the harbor, but just around the corner is Fritolin pri Cantini, another nice lunch option. Tartini Square. This is the main square in Piran. It is surrounded on three sides by colorful, Italian style buildings. The fourth side opens up to the harbor. Church of St. George. From the medieval walls, walk to the Church of St. George. Take a look inside the church and from the yard enjoy the views over the town and the Bay of Trieste. View from the Bell Tower. 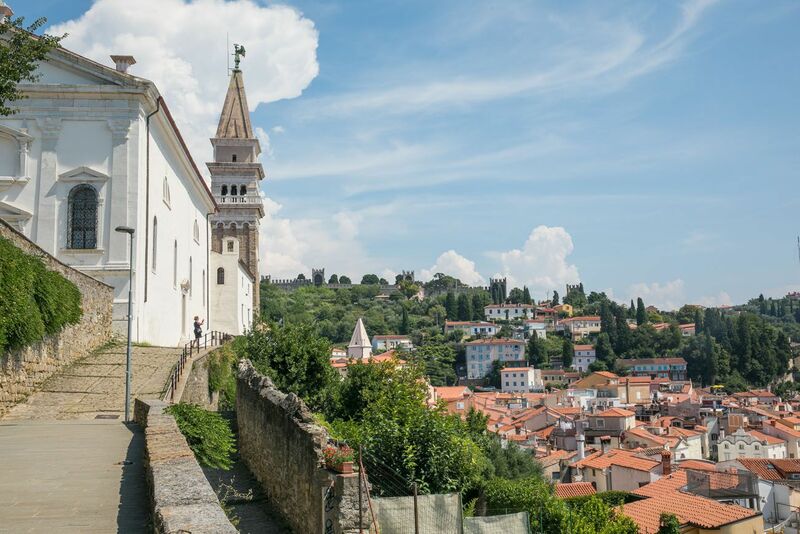 For the best view over Piran, climb the bell tower, which is located at the Church of St. George. It’s 146 steps to the top and worth it for this view. Wander the streets of the old town. The old town is a maze of narrow cobblestoned lanes and colorful houses, especially in the area between Tartini Square and the end of the peninsula. No maps are needed since it is small and compact. 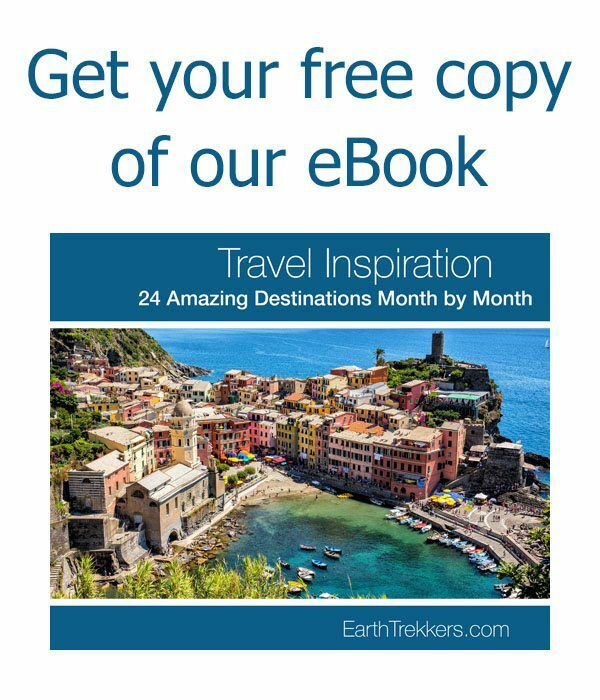 This covers the main things to see and do in Piran. Expect it to take about 2 to 3 hours to do everything mentioned above. If you have more time and energy, you can also visit Strunjan. This is a nature park that is located just outside of Piran. You can walk here from town (it’s about a 2.5 mile walk) or drive here. This is a nice spot to go to the beach and walk along the coastline. 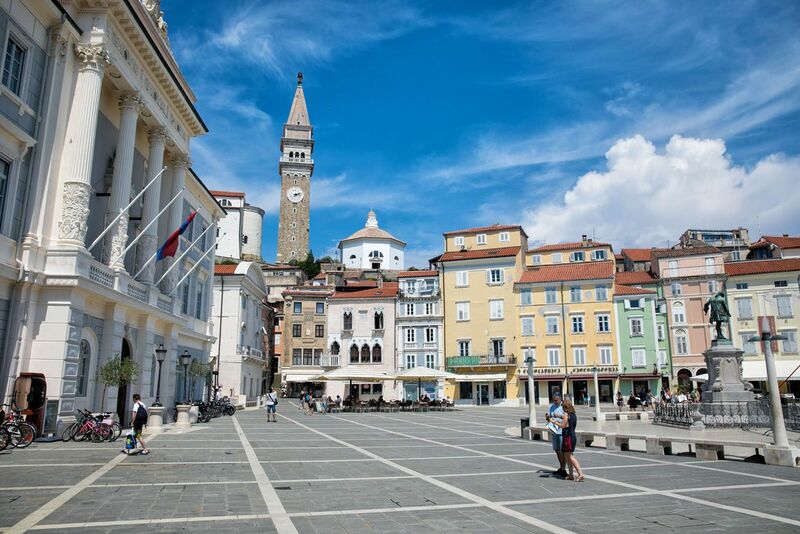 Get more information on Piran, including recommendations on where to stay, in our article 6 Great Things to do in Piran. 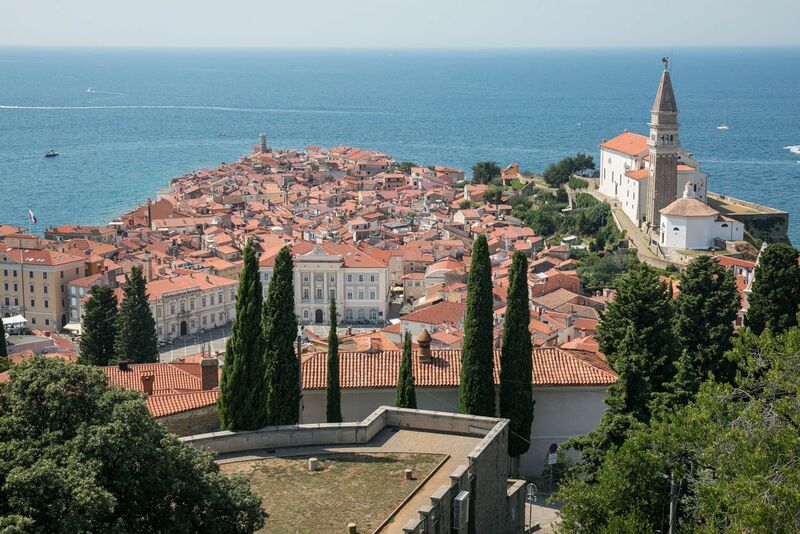 Once you are finished sightseeing in Piran, you can drive back to Ljubljana or Croatia, or wherever your day started. If you are not in a rush to say goodbye to Piran, consider staying in town for dinner. You can visit one of the restaurants we mentioned for lunch. Casa Nostromo Restaurant and Lounge Bar also makes a great dinner spot. End the day with sunset views of Piran. Good spots are from the medieval walls (the walls close at dusk), from the harbor, or from the small beaches that surround the town. 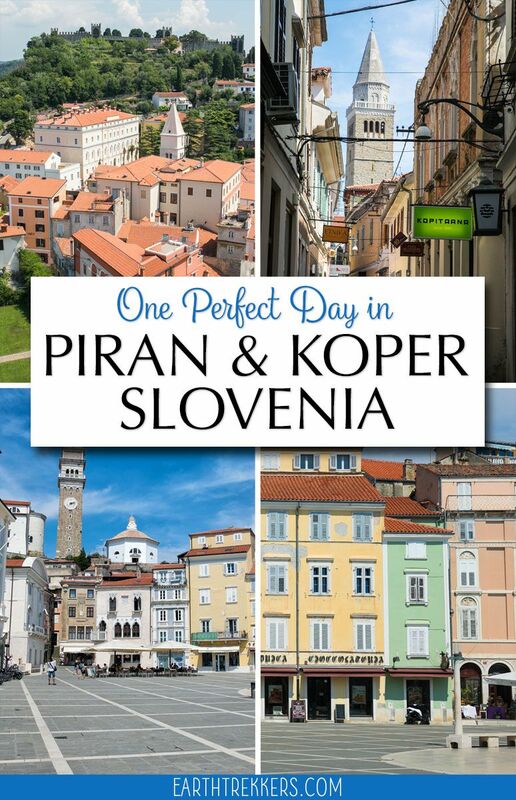 Are you planning a trip to Piran and Koper? 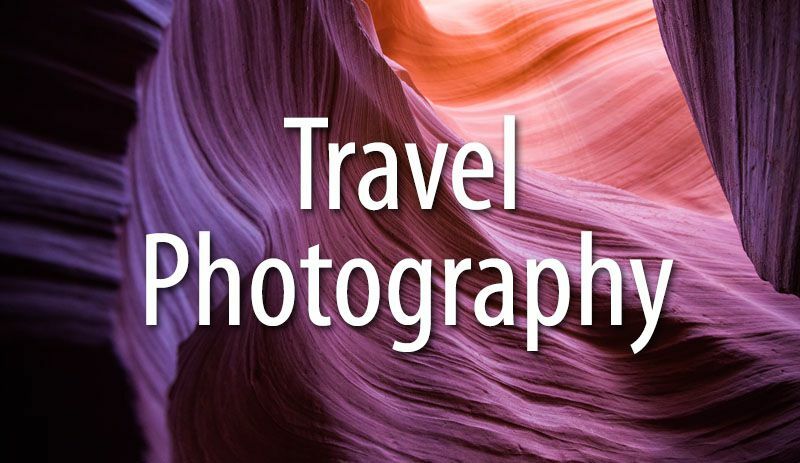 If you have any questions or if you would like to share your experience, comment below. 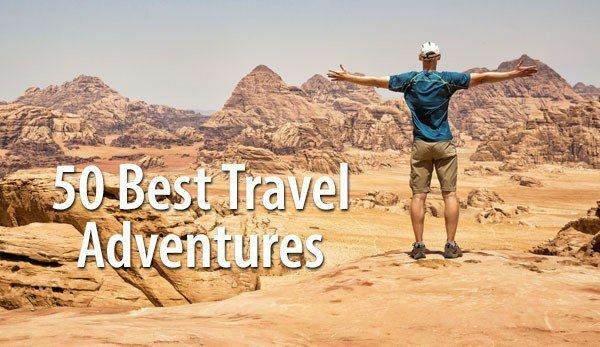 Planning a trip to Slovenia? 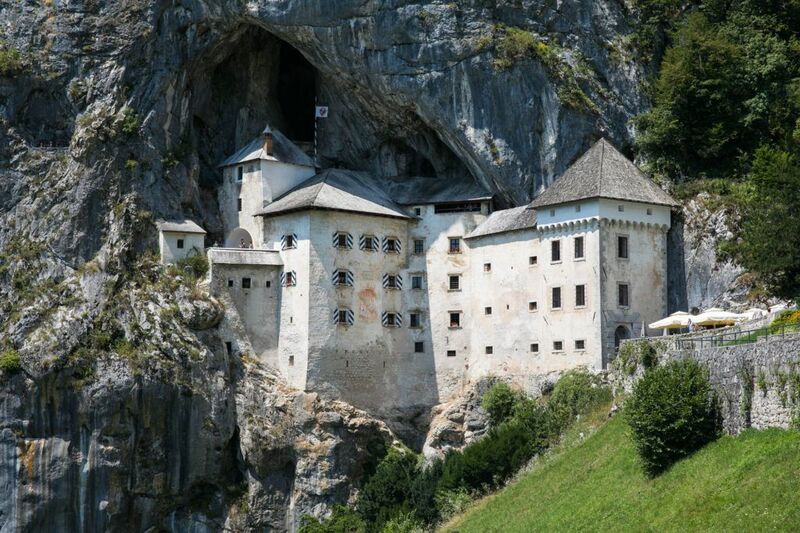 Read all of our articles in our Slovenia Destination Guide.